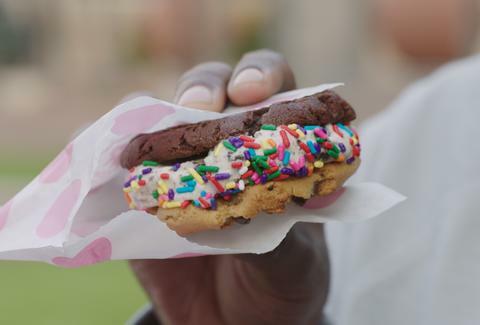 The dynamic duo known as the ice cream sandwich -- cookies and ice cream coming together in harmony for the benefit of our tastebuds -- may very well be one of the most important of mankind's many innovations. So when we saw that Baskin-Robbins was rolling out their new Warm Cookie Ice Cream Sandwiches -- allowing you to wedge any ice cream flavor in between your choice of warm, gooey cookies -- we had to let our true feelings be known about this blessed union. Yes, it’s lovely that the White Chunk Macadamia cookie and the Pistachio Almond ice cream are vibin’ together, but it’s the combination of hot and cold that transcends feeble human sensory perception like taste and mouthfeel. The hug between two warm cookies and a scoop of ice cream is the moment at the beach when the water stops feeling freezing. It’s when you realize the barbecue smells on your block are coming from the same neighbor who owes you a favor. It’s the time you were picked to be team captain in the 8th grade and made sure the class bully was chosen last as penance for being terrible. You have half rainbow sprinkles and half chopped almonds surrounding the perimeter of your sandwich -- you’re going to do the thing, and no one will look at you differently for it. That one kid who licked the mayo off his bologna in the cafeteria during sophomore year of high school, however? His social life is still trying to recover from the fallout, 15 years later. We did the math (not really but); every time you choose a popsicle, there is a 2% chance of impaling yourself due to some unforeseen tragedy, like a rollerblader barreling into you on the boardwalk while you’re halfway through a creamsicle. But cookies... cookies will never betray you like that. Each cookie holds your ice cream close to its chocolate chip bosom. Cookies will never hurt you. You are a scoop of ice cream -- fleeting, fragile, and soft -- suspended between two realities: birth and death, cookie top and cookie bottom; sprinkle to sprinkle, crumb to crumb. Have you ever seen someone walking around with cold cuts sandwiched between half of a French baguette and a slice of rye? How about a PB&J squished together by sourdough and multigrain? No. It’s just not done. 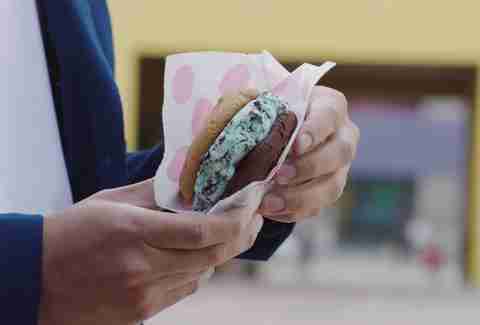 But the Warm Cookie Ice Cream Sandwich by Baskin-Robbins, ever the nonconformist, does not concern itself with limitations imposed by modern society and its myopic understanding of sandwich construction. You want Chocolate Almond ice cream between Double Fudge and Peanut Butter Chocolate Cookies? Do it. Very Berry Strawberry between White Chunk Macadamia and Dark Chocolate Chunk? Who’s going to stop you? Why not make a game of ice cream sammy roulette? You’ve got four types of cookies that can be mixed and matched, three types of toppings, and more than 31 flavors of ice cream. With so many possible combinations, it’s almost wrong to have a go-to. Craving a classic? Make a PB+J -- two Peanut Butter Chocolate cookies and a scoop of Very Berry Strawberry. Just can’t decide? Try three cookies and a double scoop to cover all your bases, though you might need silverware for this towering ice cream sandwich mountain. Why all the labels, man? A sandwich is a sandwich. Just because the ingredients that make up this particular sandwich are sweet, doesn't mean you can’t consider it a meal. So what if rainbow sprinkles aren’t Whole30? 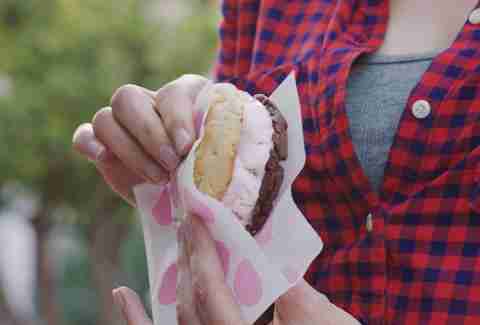 There is an unspoken ritual involved in eating an ice cream sandwich. You can feel the weight of it in your hands and the density of the ice cream between the cookies as you bite down. The exhale of cold from the newly bitten scoop of Chocolate Chip Cookie Dough. The chomp of macadamia. A chunk of chocolate. There’s so much more to eating an ice cream sandwich than just shoving it into your face; this isn’t an ordinary desk-lunch sandwich -- this is an experience.